IT TAKES TWO TO HOP!!! The first guilty party is the teacher. He wants the student to hop using the excuse that the student won’t get hurt if he hops. The second complicit party is the student. If he doesn’t agree to be a grasshopper then the hopping will be a hard time coming. But I can’t really blame the student. He seriously wants to learn something and if hopping is part of learning and deceit part of the price to pay to learn whatever secret was dangled in front of him then why not. He will be one of the very few who will be secretly indoctrinated into the secret circle, the inner few who will get whatever it is that the teacher is selling. For the teacher getting a student to hop is good marketing for him. It spices up any demonstration; it makes him seem invincible, making it easier to sell Tai Chi as a mysterious, invincible art for the chose few. The house of cards falls apart when students fail to hop or refuse to hop. Enter the excuse and threat of internal injury for the non-compliant student. One student falls in, the second too falls in and like dominoes every other student soon falls in line and voila! the grassHOPpers are born. If you want to Master Tai Chi Today do yourself a favor and don’t hop. Yes, don’t hop at the slightest touch for no good reason. If your training partner thinks he can make you hop then make him use the skill, if it really exists, to make you do so. As per Newton’s 1st Law of Motion if you just relax and don’t resist it will be very difficult for someone, even a master to try to send you flying, much less make you hop. By refusing to take part in the lie you learn to relax when being pushed. Over time you can even try to let the training partner’s power go to the ground, then bring it back up and return it to him. And if he is skillful enough to push you off balance then let him do so but maintain your body integration and you will find that your balance is still intact and your partner won’t be able to push you very far. Practicing this way both parties get to practice Tai Chi. Doing the hop doesn’t serve the student except make him seem gullible. 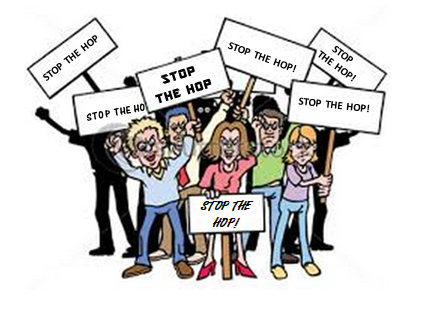 In ending I urge all sensible students alike to say STOP THE HOP. This entry was posted in Fajing, General, Practice, Push-Hands, Structure and tagged taichi, taichichuan, taiji, taijiquan, weishuren, yang style by Mushin. Bookmark the permalink.